The clutter left lying around after you finish your latest beading project. 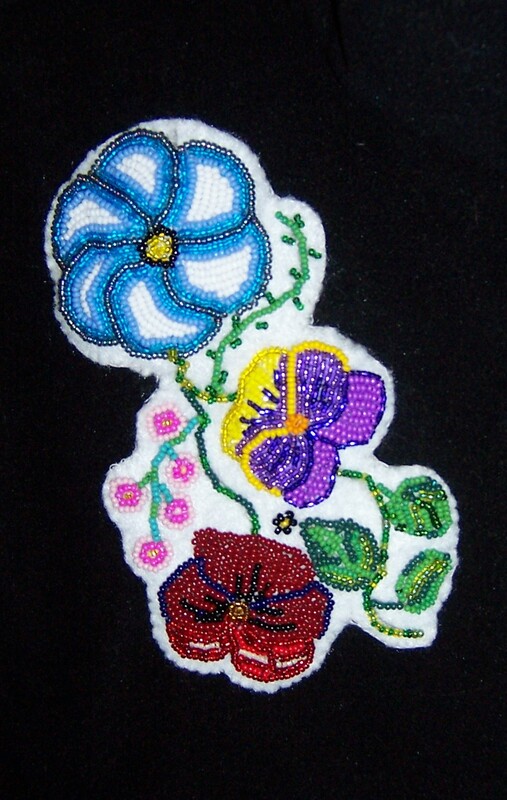 The Métis were known as “The Flower Beadwork People” and the beadwork is distinct with its flowing flower designs. Some of the original ideas came from European wallpaper or material patterns and it combined two cultures, French embroidery and indigenous beading. 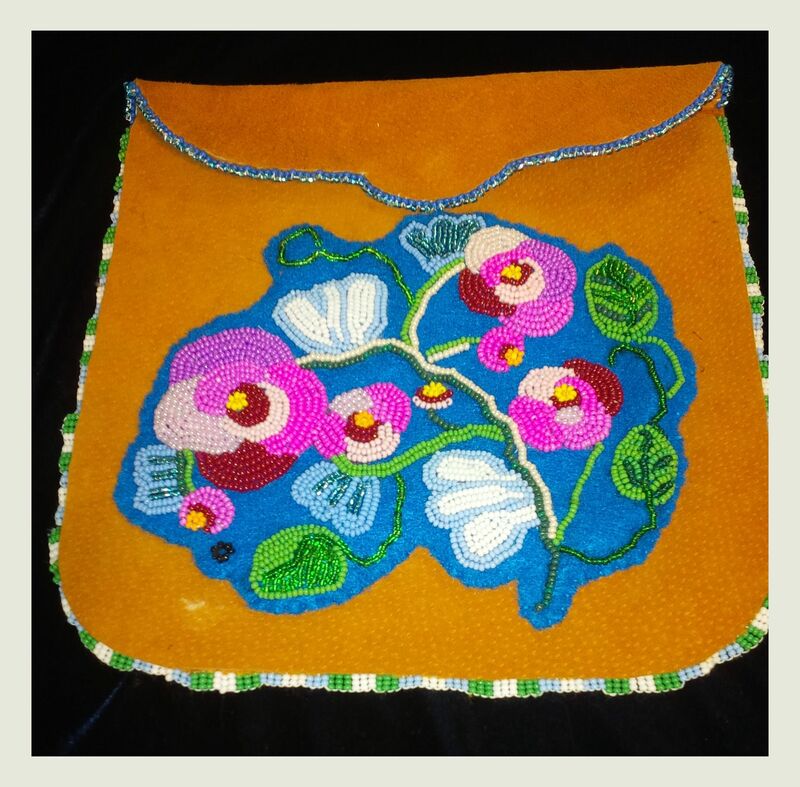 Beading was a very important component of traditional Métis culture, and was proudly displayed on coats, hats, mitts, shirts, pants, ammunition pouches, herb pouches and much more, including horse halters, bridles, blankets and saddle pads. 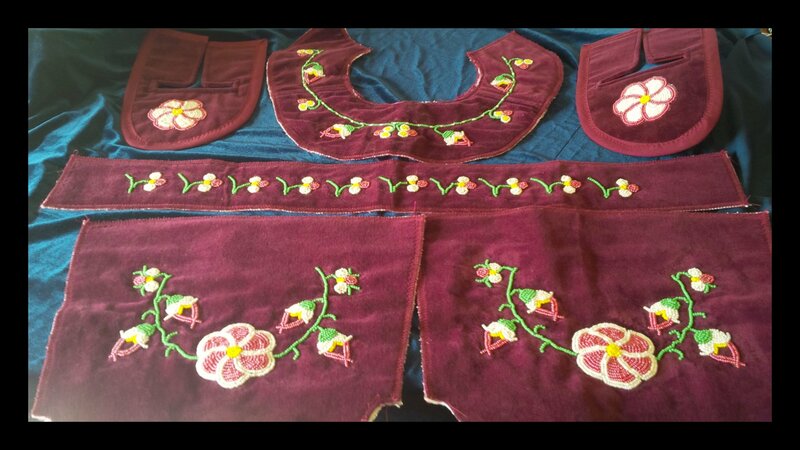 I came to beading late in life after finding out that my suspicions of native heritage somewhere along the line were confirmed approximately five years ago. 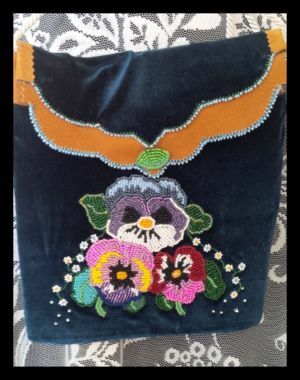 I am a true combination of the people who formed the Métis, French-Irish and Algonkian and I have always loved beads and sequins and have always had trouble with ”plain”. 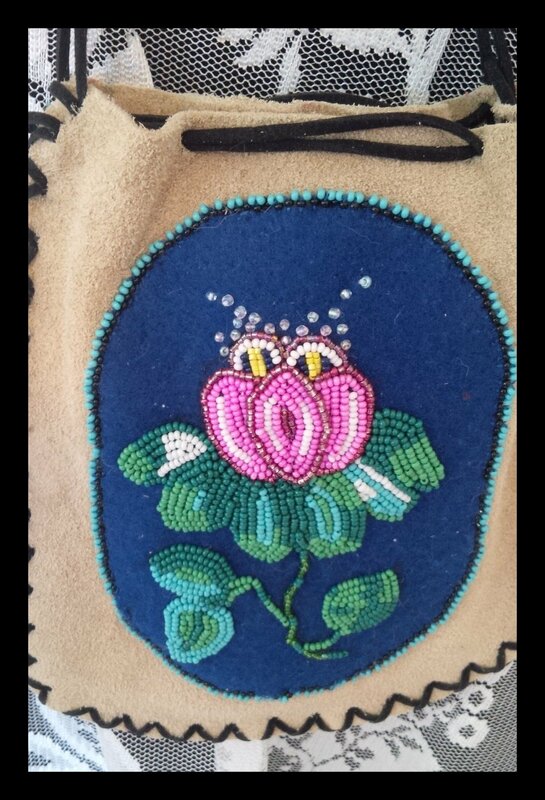 Since I was young I was attracted to beaded moccasins, beaded jackets, beaded jewelry, beaded sweaters, anything, with “bling”. My mother used to say that was “my French side” coming out. In truth I think it was my Métis blood calling out to me. 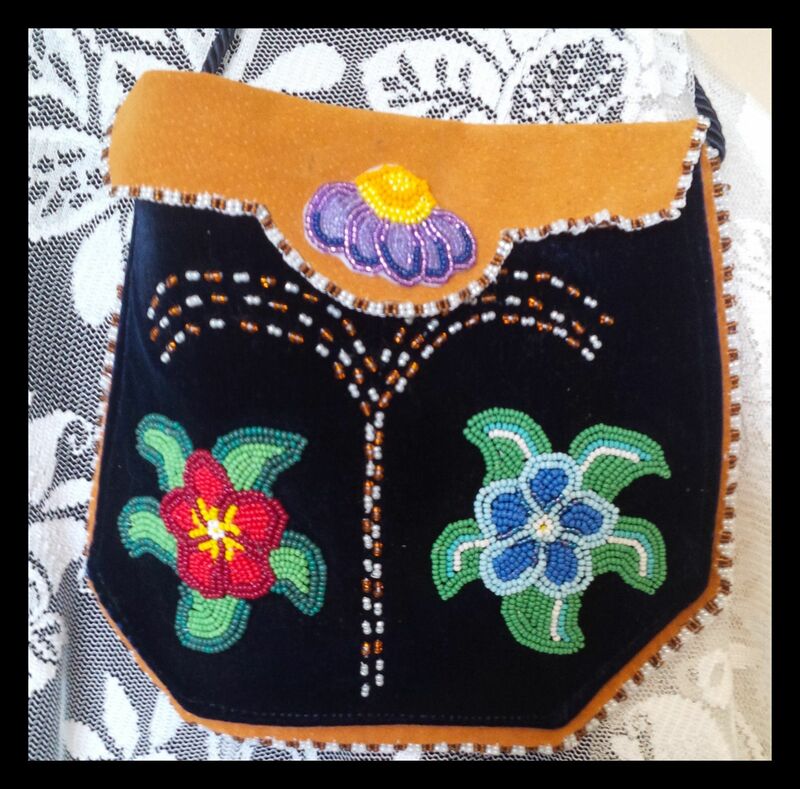 The first piece I ever did was trial and error and was a medicine bag for a friend that combined old and new, putting the Harley Davidson symbol with traditional feather patterns, the medicine wheel and Viking runes, all things that would have meaning for him. After that I was hooked. 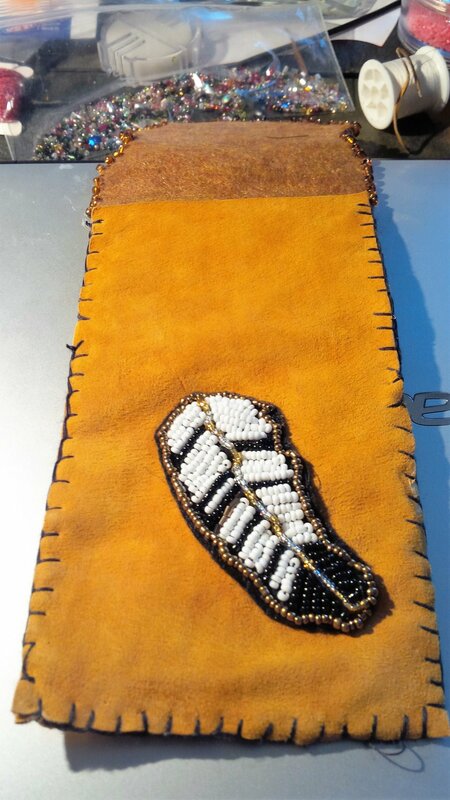 Medicine bags interested me so I did some reading and learned that Medicine Bags come in all shapes and sizes, fringed or not, decorated or not, but, generally, are all made of leather, and, ideally, hand-stitched, as Native American beliefs tend to believe that machine stitching is believed that machines ‘steal’ the power from the bag. A medicine bag is traditionally filled with talismans such as stones, herbs, found objects, personal memorabilia, etc. 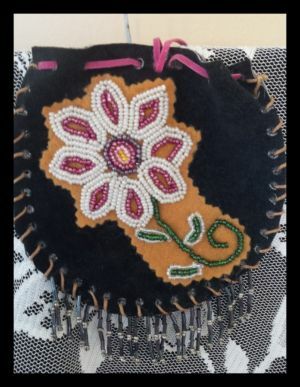 and is intended to bring protection, good luck, and/or for use in healing to/by its owner. Items can be herbs, stones, feathers, fetishes, found objects, personal items, photos, a snip of your hair, a special jewelry piece or anything that is of significance to you. 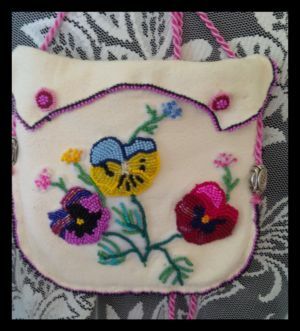 If the bag is a gift, the original owner or maker should add something of their own to it. My next ventures were small flower motif bags of the kind mentioned above. 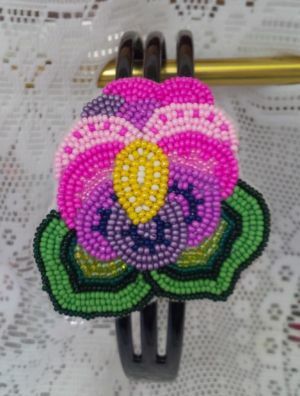 Then that morphed into doing beaded flower pieces on headbands, appliqued pieces that can be sewn onto jackets or sweaters, larger purses, jewelry, loom beading, and as of late I have branched out into beading pow-wow regalia, collars, moccasin tops, belts, and leggings. These can be personalized as much as someone wants in whatever colors or designs they like. A lot of people who have seen my work comment on the attention to detail that is required and they ask how long each piece takes, but like any great passion, if you love doing it, the time does not matter as much as the satisfaction you get with each piece when its finished. That and knowing that each very small seed bead you have sewn on by hand, is just part of the love and beauty that goes into the craft. I currently have a number of completed pieces on hand for sale. If anyone is interested in purchasing a completed piece or would like to consult about ordering a custom piece they can contact me via email at onyxroseoriginals@gmail.com and items can be viewed on my Facebook page which is also under Onyx Rose Originals. 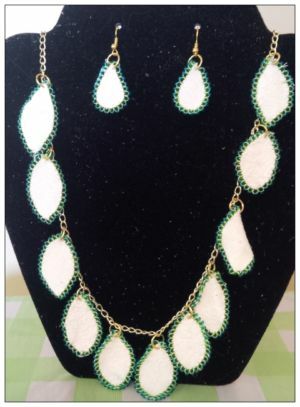 These would make great gifts for Christmas or birthdays and each piece is unique as I never do two pieces the same so everyone is truly “one of a kind”. I hope you enjoy the photos and I look forward to hearing from anyone who is interested in purchasing or ordering a piece that can be their very own “one of a kind” genuine Metis beaded item.